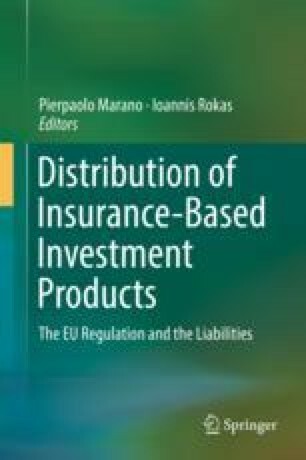 The article draws attention to the fact that the civil entrance into force of the IRA has resulted, on a larger scale than has been the case to date, in the need to analyse in practice the essence of an insurance contract in the framework of public law regulations, which is especially connected with the issue of unit-linked life insurance contract, as the most popular example of an investment based insurance product in Poland. This question is particularly important due to the fact that the IRA includes basic legal definitions, characteristic for this insurance product. The article also presents an example of activities performed by an agent within the scope of the unit-linked life insurance contracts and attention is drawn to the issue of liability of an insurance company thereunder, and, consequently, the rules of law concerning the distribution of investment-based insurance products are evaluated. In this context, the status of the IDD implementation in Poland is also referred to at the end hereof. On that occasion, the conclusion is in favour of the acceptability in the light of Polish law of performing the so-called additional activities by an agent if they are aimed (in the interest of the insurance company) at the improvement of the scope of insurance protection granted to the insured.